Long Beach City College has a variety of students: traditional, reentry, prepared and underprepared for college, working (part-time and full-time), single parents, married parents, caregivers, and homeless students. The teaching challenge for the particular section I tried Cerego in is time. It meets only once a week so the lectures are long. The learning challenge is that students will not study until right before lecture even though they have a whole week to study. Students also don't really know how to use a textbook as a tool and don't really know how to study. I cannot change the lecture schedule, but I can change what we do during lecture. Every class there is some sort of activity related to what students just learned. Students are given a quiz each week so that they keep up with their studies. But even with the review and weekly quizzes, students are still not spending enough time out of class to really learn and understand the material. Students do not spend enough time on task engaged in really learning the material outside of class. I was invited to participate in a summer trial of Cerego, called the Cerego Challenge. I instantly liked it. I liked that it asked review questions in different ways: multiple choice, typing in the answer (so students can learn how to spell vocabulary words! ), fill in the blank, and that you can also use figures, illustrations and visuals (especially important for learning anatomy). I see the biggest challenge as productive time on task. Cerego is easily accessible to students, especially if they have the app on their phone. During the lecture breaks, I could hear students working on the current Cerego assignment. So they were immediately reviewing the material. This program allows students to spend quality time learning the material. My students love the program because it makes studying easy and fun. It takes the guesswork out of what they need to know and it helps them review the material outside of class. 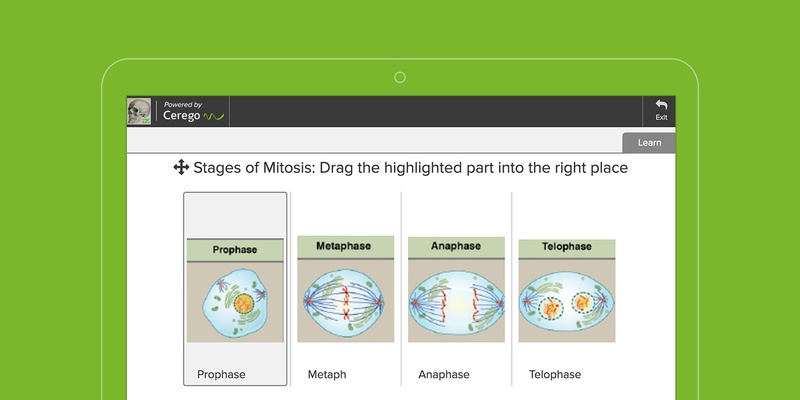 It is easy to use the free app, making studying a breeze even when students don't have their notes with them. One of my students said she uses Cerego while she is waiting for her clients. Students also like the "It’s time to refresh your memories" reminder. As the professor, I know students are studying the correct information because I set up the content. I also like the variety of questions that can be asked, with new types of questions coming. I like that it can be integrated with Canvas so I don't have to grade the assignments. My students like Cerego so much, they recommend I use it for the Human Biology Lab course. I am also piloting Cerego with my Anatomy lecture in Fall 2017. The assignments can be made available via Canvas, thus students see when they are due on the Canvas calendar. Once you get the integration set up, the grades are automatically entered into the Canvas gradebook. This saves time entering grades.